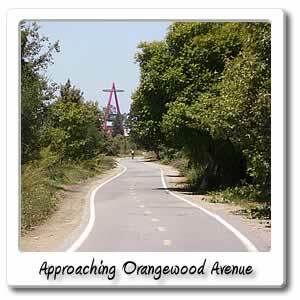 Welcome to Orangewood Avenue on the Santa Ana River bicycle trail. 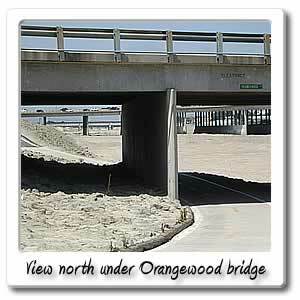 At 12.5 miles and a little bit more than 1 hour from the beach is the Orangewood Avenue entry/exit point. 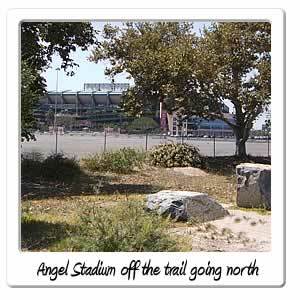 Getting off the trail, and heading west on Orangewood Avenue, in the City of Anaheim, will take you to the south entrance to Angel Stadium. 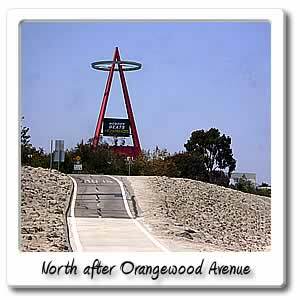 The main entrance to Angel Stadium of Anaheim is off of State College Boulevard at 2000 Gene Autry Way. From early April to late September, you can catch an Angels game. 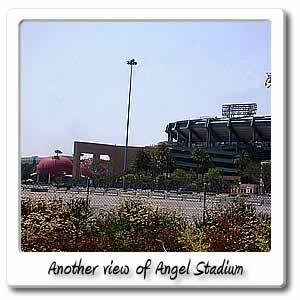 Check out the Angel Stadium of Anaheim page for more information about the stadium. About 1/2 west getting off of the trail, you'll come up to State College Blvd. here you will find a Del Taco, OC Sports Grill and a Wells Fargo, if any of these aren't to your liking go north on the trail and get off at Katella Avenue. 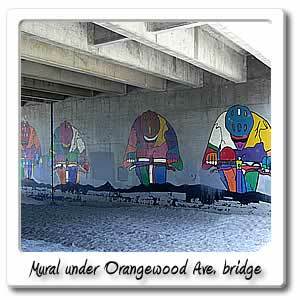 By going east after getting off the trail at orangewood Avenue, you won't find any food or drink or any other services. You will find El Camino Real Park, in the City of Orange ,about 1/2 mile after getting off the trail at 400 North Main Street in the City of Orange. At the park, you'll find a picnic area with 8 benches and overhang, two tot-lot playgrounds, two lighted softball fields, and six lighted volleyball courts, that are available only be reservation. The park was formed in 1978 on 18.67 acres and also has six handball courts.